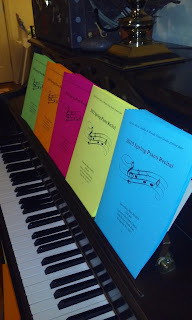 Since it was the spring recital, I printed the programs on vibrantly colored paper. Inside, I presented the musical program and short autobiographies about each student. They enjoyed telling me what to write about them! I put the programs on music stands at the recital. After some brief opening comments, the recital began. My husband took a photo of every student, which I emailed to the parents afterwards. I asked for each parent's permission before posting any pictures of their child. Each student played one piece. Since only six of my students were able to participate that day, the recital was very short and sweet! It was a perfect length for the young children in the audience. The students collected their awards following the recital and went to the reception. This is the only picture that I have of the reception! I'm enjoying ginger ale and grape juice punch with my sister, who graciously helped me bake chocolate chip cookies and brownies for the big event earlier that morning!!! I'm so proud of each student that participated! All of their hard work paid off! I'm looking forward to the next recital!